Tony Ward brings us yet another fantastic collection of couture evening wear for Fall Winter 2013-14. The textiles are amazing. The red checkerboard textile that glows with the use of silken thread is artfully crafted. I love the gold accents. At times it looks like gold leaf and looks great against the black, the white and elsewhere in the collection. He does very creative things with it. The details of this collection are notable. Laser cut leather, appliqued lace and geometric patterns in applied textures. 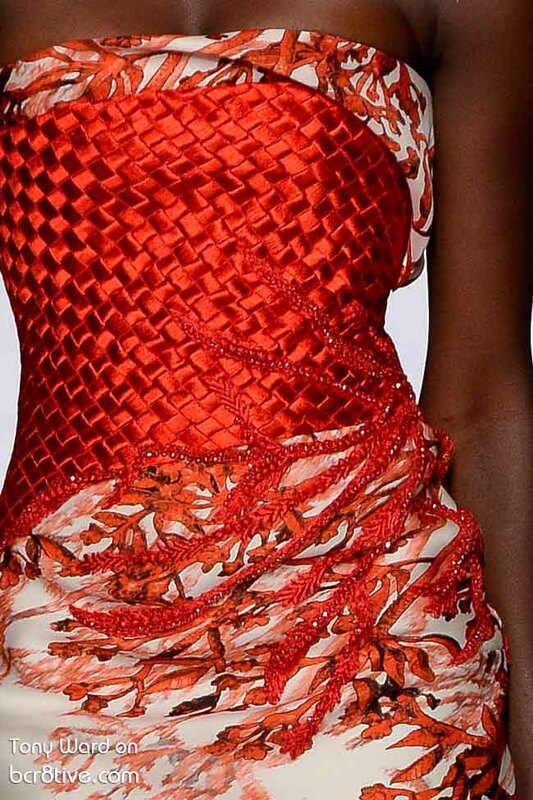 Fabrics are artfully sculpted on so many designs. These sculptured fabrics coalesce with an abundance of beading, embroidery and exquisite appliques. The appliques are at times an integral part of an overall texture and then at other times a major design element. At times a fabric appears to be hand painted and then embroidery is applied over it, creating a unique 3D effect. This collection is rich with skilled decorative arts and filled with examples of couture precision.